Matt loved everything about his family. You’d never get him to admit to it, after all, what self-respecting twelve-year-old would admit that they loved spending a nice evening at home with your mother who was practically ancient (all parents are after all) or his lame older brother who was probably the lamest lamer to ever lame. It was just having a quiet evening at home reminded him of playing Sorry with his parents going all out against each other and ignoring their young sons winning the game within half an hour or his father trying to make spaghetti and failing epically while his mother burned the garlic bread to charcoal. It was the love and the feeling of home and safety and the ‘nothing can get you while you’re under our roof’ that his parents had always managed to pull off even after they had separated and divorced. The quiet evenings with everyone in didn’t happen an awful lot anymore. Terry was too busy with work and school and his stupid girlfriend (who Matt actually liked pretty well, but she was taking up more of his lame brother’s time than she needed and she must have something wrong with her in the first place to agree to even be friends with Terry let alone date him.) His mom was always working, even when she was at home, practically glued to her laptop while finishing whatever project was assigned for that week. When she wasn’t working she was exhausted even as she went through the motions to put together something for them to eat. That didn’t mean that they didn’t have quiet evenings now and then and for that Matt would always be grateful. He didn’t think he much cared for growing up when he realized that it meant things like this could slowly vanish from your life with just enough of it left for you to remember better times and strive to bring those moments back. Life was a lot harder than he had ever thought it would be when he was sandwiched with his brother between their parents watching some meaningless movie while consuming an unhealthy amount of salt and butter on their popcorn. Matt shook his head at his maudlin thoughts and moved into the kitchen before his mother could come out of the bathroom she’d disappeared into after returning home from work. He might as well get dinner started as Mary had looked a little more drawn around the edges than usual and he didn’t want his mother to be even more tired than she already was. I loved the sun as a child. My eyes were one of the few in my family that grew accustomed to the brightness level of wherever I was. I enjoyed the coolness of the shade and the way shadows disappeared, but tht e was always something about the sun that I just loved. Maybe it was the flowers and the fruit that grew in my backyard. Without the sun (all right, and the rain, which I also loved) there wouldn’t have been the plentiful amount of berries or apples that were always ready to eat. But I absolutely adored the way the sun caused my shadow to follow me around all over the place (so long as I avoided any shade, that is.) My neighbors had a driveway that went up a hill rather than down into like mine and whenever the sun was setting My shadow was able to play along right me as the same size. Now that I’m an adult, however, and with health like mine (migraines all the time) the sun isn’t as much my friend. So I am grateful for sunglasses because they allow me to return to the joy of my youth with the sun without having to worry about that lovely brightness stabbing me in the face. My shadow isn’t quite as fast anymore, but is still a wonderful companion. This was how my newest brother-in-law asked my youngest sister to marry him almost a year and a half ago. He took her to where they met, our elementary school, and they walked around it reminiscing while his sister quickly set this up on a chair near where we would all leave the school to walk home together. He had promised her a cookie a few weeks earlier when she’d been craving them. 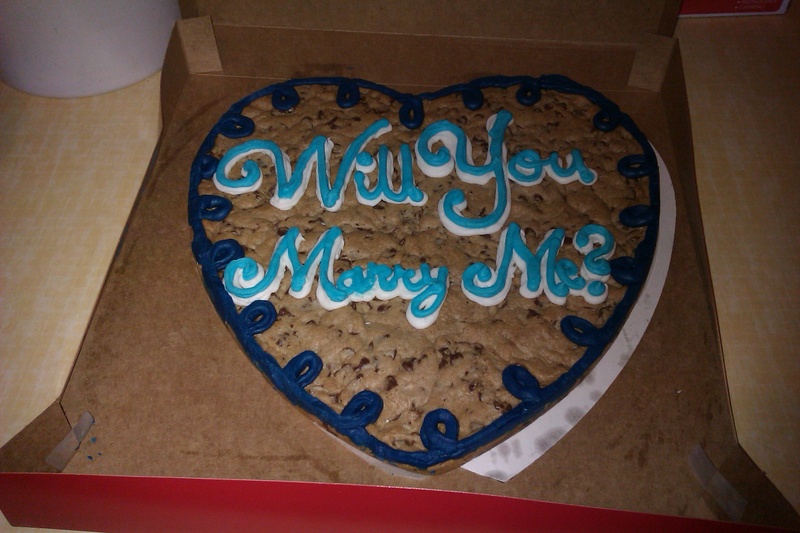 After opening the box and seeing this, she turned around to find him down on one knee. This is the picture that caught my eye when I went looking through my pictures for Eclectic Corner #8: Splash of Colour. Thinking often of the time we shared. As the first to hold my heart. How I cherish the memories left behind. Even one thing left with me. This poem and the video were what came to mind for this week’s Stream of Consciousness prompt: attach/attachment. In my senior year of high school I found myself constantly moving. I don’t actually remember sleeping all that much and yet the whole year is a blur of movement and half-awake moments. I had so many credits that I needed to make up for as I’d missed so much the year before. I had this belief that if I just kept moving even though I was stumbling along that even if I tripped my momentum would carry me forward and I’d manage to, somehow, finish it. I know that I didn’t do it alone. There’s no way that I could do it by myself. I was very blessed to have help every single step of the way. But that’s only part of why I am even writing this particular post. I was reading through the Reader on here when I came across a new post from Seth Adam Smith, who has been MIA for several months while he worked on super secret projects. His post Is It Possible to Fall UP? made me think about such a thing where it has concerned me and that, in turn, made me think of the times (so many times) of when I would fall up the stairs rather than down them. I fell down stairs a lot as a child. No that is not a euphemism, all those falls were legit. I was very spastic as a child though I was never diagnosed with anything, but we learned that I was sensitive to refined sugars. As an adult, refined sugar makes me jump all over the place, literally, before I crash because I can no longer sustain such energy. This is after having one small piece of Halloween candy. As a child, I would eat, at least, one full cup of sugar straight. Because it tasted good and what other reason does a kid need? Yeah. I was continually on a sugar high for the majority of my childhood and early teens. I have no idea how I survived all of the stupid things I’d try and do while I was like that. Anyway, I fell down the stairs, and out of trees (and I jumped a few times trying to ‘fly’) a lot as a child. In high school I didn’t fall down the stairs even though I tripped a lot. No, because I had enough momentum to my body I fell UP the stairs instead. It was hilarious and I always laughed about it at the time (and ignored bruises because I was just too tired to care.) But after reading that post by Seth and watching the embedded video (seriously, go watch it) I have found myself thinking about those moments in a different light and answering the question that Seth posed in his post title. Is it possible to fall up? Yes. Yes it is possible to fall up. It is possible to also teach yourself how to turn future falls into a roll that will see you standing up on your feet before the fall is even over. Some of us will have more falls and more opportunities to learn that maneuver than others, but in the end we all want to learn this skill and continue to hone it throughout the years so that we never forget the feeling of the fall followed by the feeling of our feet back on the ground, safe and sound. What a laugh it would have been, if Daddy had only seen Mommy kissing Santa Claus last night! Spent most of my childhood thinking this song was a prelude to a long divorce process. I wondered why it would matter to ‘Mom and Dad’ to want school to start again. Mine had work during the holidays and my elder siblings were the ones who watched us during Winter Break and counted down the days ’til it was over. There are a lot of different songs that made no sense to me until I was an adult. Does switching which parent’s house we’re at each year count?